We are a long-established family business, based in Northamptonshire, selling livestock equipment direct to farm across the UK. To keep up to date with our news and offers please follow or like us. 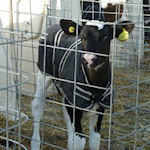 Calf jackets keep calves warm in cold weather so they use more of their energy to grow and stay healthy. Use them for calves from birth to around 5 weeks old, when the night-time minimum temperature is below 10 degrees C.
After researching the market, we recommend Cosy Calf jackets for use with our hutches. They are well-made, use good quality material and fastenings, are generously sized and nicely shaped. You can buy calf jackets from our online shop with free, next working day delivery. Jackets are made from an outer shell of 600D Oxford, with a 200g filling and a 210D lining. The large size is suitable for beef / Holstein breeds and is black. The small size is suitable for Jerseys and is brown. 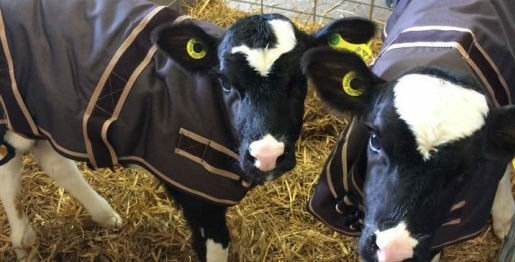 We find calf hutches and jackets work very well together as a cost-effective way to optimise calf health and performance"
See pictures of jackets in use on farms across the UK.